There’s nothing I hate more than dressing up. Well, that’s probably not completely true. I probably hate other things as much or more. But in this moment, the Friday night before I start a new job – the first job I’ve had in ten years that requires me to dress “Business Casual”– I detest the fact that next week I will have to wear clothes that I don’t want to wear and shoes that will invariably hurt my feet. Almost as bad as wearing the clothes, is shopping for the clothes. I come from short stock and inherited the husky genes of the Eastern European women that came before me. That combination precludes me from finding almost anything off the rack that fits me. I have to hem all my pants, and even the sleeves of business suits. Shirt length is a problem, too. Apparently only tall persons are meant to have broad bodies. As if that weren’t enough, I have feet that are flatter than the plains of Nebraska. I’m supposed to wear custom orthotics to fool my feet into thinking they have an arch, but that rules out about 99% of shoes in the world. The rigid blue plastic inserts add just enough height that my heel slips right out of the shoe with every step I take. Add to this that the forms, made after my doctor molded “fitted polyester casting socks” to my oddly shaped feet, drop off abruptly before the ball of my foot, leaving a hard ridge that reminds me constantly of its presence via blisters. To deal with these abhorrent problems, when I do find clothes that fit, I buy at least half a dozen of them in different colors. Yes, I’m one of those people. Normally, I only have to worry about buying t-shirts, jeans, and the occasional pair of sneakers, though, which is considerably more manageable than maintaining a wardrobe of Business Casual. Years ago, when I escaped corporate America for smaller companies, I swore would never again work for anyone that forced me to dress up. I know. Never say never. In high school, I played clarinet in the concert band. Girls had to wear floor-length black polyester sleeveless dresses with a mile-long zipper up the back, underneath which were white blouses, also polyester. We despised the puffy long sleeves and odd built-in scarf thingy that tied in a complicated way under our chins and hung like a long narrow double bib down our fronts. Boys got to wear black pants and jackets with white button down shirts so at least they looked like they were from the century we were living in. My sister, two years behind me, joined band when she got to high school, and when it came time for her to don the hideous outfit, she expressed her disgust like all of us had before her; she questioned why we had to wear uniforms at all. Despite the fact that I agreed with her, in an effort to prove my superior knowledge, I answered her complaints quickly by regurgitating the reasoning I’d heard from our band director when I was a freshman. Drum roll, please. Uniforms create uniformity. If we all looked alike, we would effectively disappear, and the audience would not be distracted from the music in any way. We were not there to be individuals. Not to mention, we were an accomplished lot for a high school band, with a director who could have wiped the floor with Richard Dreyfuss in Mr. Holland’s Opus. We should look the part. Of course, I failed to acknowledge that none of these reasons explained the necessity of our particular abominable uniform. As I write this, I have to admit that I still can’t find much fault in the reasons we had to wear uniforms in high school band, which perhaps makes the teeth of my argument against Business Casual a bit less sharp. Nonetheless, I still seethe with irritation at the thought. I can’t decide if being forced to dress a certain way as an adult feels more invasive than it did when I was still a teenager, or if it was just too long ago for me to recall the degree to which I felt oppressed in high school. I do remember a sort of resignation that came with the knowledge that at least we all had to wear exactly the same thing, so I looked no worse and was no less comfortable than the person next to me. It might not be evident based on my opinion of business dress codes, but I am actually not much of a rebel at all. Most people that know me would say I’m quite rule-bound. I hate being late to anything; in fact, if I’m not at least fifteen minutes early that qualifies as late. I obey all the traffic laws and am what you would call a defensive driver. I wait for the walk signal even when the street is empty. I never cut in line or miss a deadline. Early in my career, when I was first thrust into an environment in which business suits were the norm, I had the same issues with locating clothes that I do today. I was young and fresh, though; eager to impress the experienced consultants around me, I suppressed the dress-clothes-loathing part of my personality and aimed to conform. I even wore some sort of strap meant for people with tennis elbow to cover a tattoo on my forearm. After I left the corporate world, I kept only one suit, and for more than a decade, it served as my all-purpose outfit for interviews, weddings, and funerals. But, here I am, making a foray back into corporate America, forced again to comply with the policy of Business Casual. Why, I wonder, do people still believe casual clothes aren’t appropriate for an office? My girlfriend says dressing up shows respect for the role. While I don’t disagree, neither do I believe dress clothes are necessary to illustrate respect. I do understand why it makes sense in her world – the world of a public school principal. She wants to portray authority and while formal dress cannot accomplish that alone, it can certainly bolster her image. She also happens to be tall and thin; she can be comfortable in anything. My issue is not with those that enjoy dressing up. To them, I say, have at it. But for people like me, dressing up is a form of torture. I’m physically and mentally uncomfortable, inherently in a worse mood than I would otherwise be, and I can’t wait to get out of the office at the end of the day so I can be comfortable again. I can guarantee Business Casual has a negative impact on my productivity, even if it is slight. The stinger in Business Casual is, without a doubt, “Casual Friday”. You might think it would ease the pain of having to dress up the rest of the week, but to me it simply makes an absurd rule even more preposterous. It tells us that the corporate rule-makers acknowledge the constraint of Business Casual is loathsome; otherwise why throw in the “perk” of being able to dress down on Fridays? Or taken another way, if the powers that be truly believe we won’t conduct ourselves appropriately in jeans, do they expect we won’t get anything done on Fridays? Note: Just to clarify for regular readers that I’m not actually about to start a new job, I wrote this last summer. “My professional life is really looking up,” I thought to myself at the end of that painful hour. Then I began my work. One of my tasks was to update a stakeholder “molecule diagram,” which had been drafted by another consultant that came before me but then left the company mysteriously. A “molecule diagram” is sort of what you’d think it’d be, but applied in a way that is somehow both superfluous and just plain stupid. In this case, company departments were named in circles randomly placed on a large page, connected with lines of varying length to a central circle that represented the project (the project that needed the head on the horse). Then, individual stakeholders were shown in smaller circles that spider-ed out from the department circles. I can only imagine if it were a model of a real thing, it’d be some kind of free-will-stealing, integrity-thieving, crazy-making substance we’d all best stay far away from. Even as a poorly chosen representational thing, it had that effect on me. Last week, in my role as consultant extraordinaire (*sarcastic cough*), I was introduced to a man from another firm, who is working in a different capacity on the same “corporate initiative” I am assigned to. It will be my role to interview, investigate, analyze and document the perceptions and desires of the stakeholders that will be impacted by the aforementioned initiative. The purpose of my information gathering is to locate “levers and barriers,” to craft an appropriate messaging strategy, to evaluate the organization’s readiness for change, and generally advise the manager of the initiative, who refers to himself as the “head on the horse,” as to how he can best use the information I prepare to essentially cram some new software down the throats of the people that actually perform the organization’s work. I am creating many “deliverables;” things like a stakeholder inventory, a perception map, a stakeholder management plan, a change management plan, and a communications management plan, among other things. Safety is big at my workplace. Really big. It’s the kind of company that is highly regulated, and subject to all sorts of safety standards, as it should be. In the small hallway where I work, there are 8 cubes, 4 on each side of the walkway. Four of them have large signs hanging from the ceiling above them with a big red cross against a white background. That is because there are four safety monitors in my immediate vicinity. Should we have an emergency, they would perform a variety of pre-assigned and practiced actions, including sweeping the building to make sure everyone evacuated and assisting any persons that may not be able to get out of the office under their own power. I feel very safe at work. Except, perhaps, when I’m in the elevator. 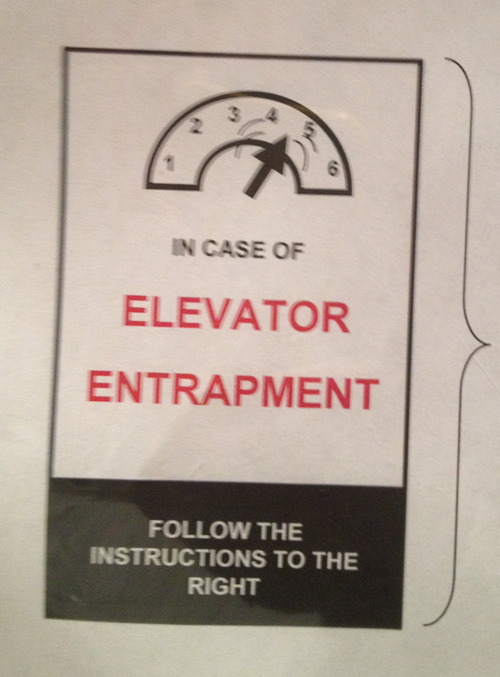 Upon entering the elevator in our building, I am greeted with this sign. I have a feeling that anyone entrapped by the elevator would likely attempt all of the above instructions without needing a reminder, but who knows? 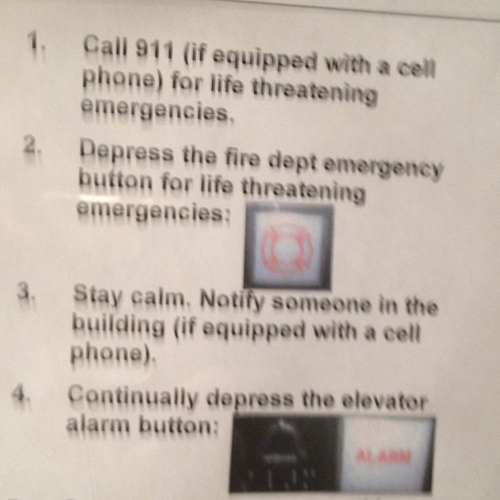 Whenever I ride the elevator, I play in my mind a little scene with an unfortunately paranoid and anxious person reading the list aloud while thinking to himself, “Is this a life threatening emergency? Am I equipped with a cell phone? Stay calm? Who the hell do you think you are telling me to stay calm? !” Of course, this is done while repeatedly mashing the elevator alarm button, which instruction seems designed to increase the anxiety of the entrapped. Maybe “Stay calm,” should be the first step? It’s that time again. I’m in the middle of a deployment tonight – this time it’s not a new software release, but the replacement of a server that runs a portion of the software platform my company is responsible for. It’s a pretty complicated process, made more so by the fact that The Chinese Contingent is conversing in Chinese in the Skype chat I have going with them. To keep up, I’m constantly copying and pasting their messages into Google Translator. So, my task at the moment is to wait for his evaluate. Since I am stuck translating tonight, I will share the love and give you a different sort of translation challenge to chew on. Earlier this evening, I got an email about the server replacement (technically called a cutover), and my other half was closer to my computer than I was – I asked her to read the email to me. [Note: Person and animal names changed to protect the innocent.] Now, I didn’t give my other half any background before reading this email, and she only got through the first sentence before she looked at me, puzzled, and said, “Is this real? Is it a joke?” I said, “No. Keep reading.” When she got to the final line, she read $ssh as “Shhhhhhh!” This was highly amusing to me, though it may not be to you unless you are also a computer nerd. It is common practice for development shops to give their servers names, and they often pick fairly random classes of terms to use. In this case, animals. Our client names their software releases after cars, and their servers after animals – most of the time. I love that sentence, don’t you? If you are really interested in knowing what it means, let me know, but it’s not actually very exciting at all, and I expect most of you would fall asleep if I spelled it out. I will say, though, that ‘nap-happy’ refers to a server, so there must be some servers our client has that are named according to emotions – or perhaps the seven dwarves – I can’t really be sure.